Zuckersüße Rebellen Terry, Douglas A. In response to a new surge of interest in esthetic orthodontic techniques, this exceptional book details the state of the art in lingual orthodontics. Featuring the experiential knowledge of 34 of the best clinicians from around the world who practice lingual orthodontics on a daily basis, this book represents the first comprehensive clinical reference on the lingual orthodontic technique and reviews the latest advancements in the field, including available bracket systems, innovations in laboratory and simulation techniques, standard biomechanics from alignment to finishing, effective clinical protocols, and helpful tips and tricks for efficient treatment. 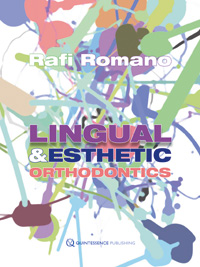 No other book can match its timely, in-depth coverage of the field of lingual orthodontics. Bracketless Lingual Orthodontics, first published by Professor Aldo Macchi, evolved from the need to treat relapsed anterior tooth malpositions without patients undergoing further multibracket therapy. In a landscape characterized by increased demand for treatment by adult patients, and the need for invisible therapies in order to overcome issues of anxiety and embarrassment, the scope of its application has subsequently expanded to include increasingly complex malocclusions. Although most discussions of the relationship between the teeth, orofacial muscles, and temporomandibular joints focus on diagnosis, this essential book outlines the guiding principles of clinical therapy to maintain or recover function as part of orthodontic treatment. In this forthcoming book, experienced author and clinician Dr Giuseppe Cozzani begins with a discussion of the fundamentals of normal and abnormal function of the temporomandibular joint. Nanda, Ram S. / Tosun, Yahya S.
Effective wire bending techniques that are customized to each individual patient make orthodontic treatment more efficient and can reduce treatment time. In lieu of overly complicated wire bending, the author of this manual promotes precise, intuitive bending and presents the proven methods that work with any biologically compatible wire. Notable scientific and clinical progress has been made in lingual orthodontics in recent years, including developing techniques, products, new 3-D laboratory procedures, and a leap in bracket evolution design. For these reasons we have been influenced by research and clinical experience as well as the desire to improve the lingual bracket design. Additionally, this book addresses the possible harmful effects of the Herbst appliance on the temporomandibular joint, the anchorage teeth, and the tooth-supporting hard and soft tissue structures. Miles, Peter / Rinchuse, Daniel / Rinchuse, Donald J. Despite the ever-expanding array of orthodontic journals and textbooks available today, too many clinical decisions are based on either anecdotal evidence or the espoused treatment philosophy of the current luminary of the lecture circuit.